Ed Schultz on MSNBC. The liberal news host is moving to Russia Today. Ed Schultz, the progressive talk radio host and former MSNBC personality, has landed at RT America -- the Kremlin-backed cable news channel that has been criticized for advocating a pro-Russian agenda. 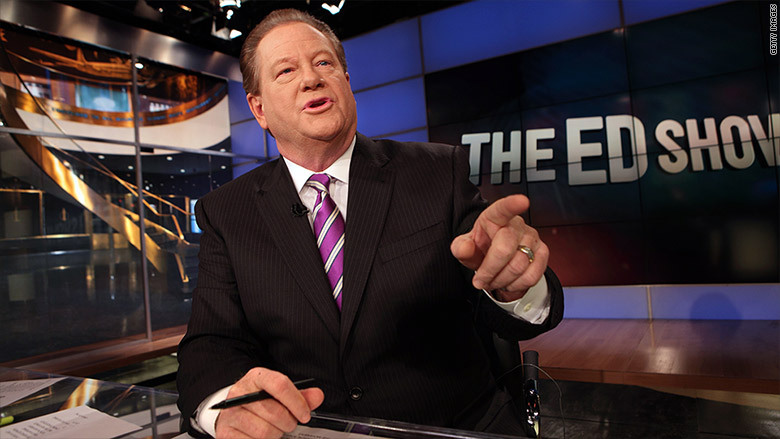 Schultz will host "News with Ed Schultz," a 30-minute newscast at 8 p.m. weeknights. "It will put me in a different light," Schultz said in a phone interview with CNNMoney, meaning he'll deliver "less commentary" than he did on MSNBC. "But the stories are going to be very similar -- very connected to the American middle class." RT America is an arm of Russia Today. Asked about concerns that Russia's funding of the channel will slant his coverage, he said, "I think that's hogwash. Absolutely ridiculous. Nobody's going to tell Ed Schultz what to say or how to say it or what stories to pick." He'll start anchoring out of RT's Washington studios on January 25. On MSNBC, Schultz was known for championing the middle class and organized labor while fighting against Washington corruption and corporate interests. In a 30-second ad for his new show, Schultz promised to cover the same themes. "For decades, the American middle class has been railroaded by Washington politics," Schultz says in the ad. "Big money corporate interests has drowned out a lot of voices. That's how it is in the news culture in this country now. That's where I come in... I'll make sure you don't get railroaded, and you'll get the straight talk and the straight news." Then he recites Russia Today's slogan: "Question more." Schultz was one of the most outspoken voices on MSNBC until last summer, when the network decided to cut its late-afternoon lineup of liberal programming. For Schultz, who had come to be seen as the network's liberal answer to Rush Limbaugh, there was no longer a clear fit at an increasingly news-centric MSNBC. But his ratings track record -- particularly when his "Ed Show" aired at 8 p.m. -- suggests that he has a following. "I know I've got an audience, and I'm looking forward to being back on TV," he said Thursday. His fans might have a hard time finding him on RT America, however. The channel says it is available in 85 million homes in the United States, but it does not have prime channel positions like CNN and Fox News have. In recent years, the network has been widely criticized for having a pro-Kremlin bias and for ignoring or silencing opposing viewpoints. Time magazine called Russia Today "Vladimir Putin's On-Air Media Machine" last year. When Russia invaded Ukraine, in 2014, the network claimed that Russia had been "forced" to act and was a "stabilizing" force in the region -- assertions that held little weight in the global court of public opinion. When one of its anchors, Abby Martin, went on air to condemn the invasion, the network responded by endorsing her right to free speech -- but also by announcing that it would send her to Crimea. Days later, Liz Wahl, an anchor in RT's Washington bureau, declared that she was resigning, because she "could not be part of a network funded by the Russian government that whitewashed the actions of Putin." Schultz said he has spent several weeks at RT America's Washington newsroom and found "no evidence" of interference from the Russian government. "While others are cutting back, RT America is expanding," he added.